Forms /of life/ in Nature unfold through a long-term evolution and natural selection and their structures, materials and processes fine-tune themselves through billions of years into the most optimal solutions, while inferior ones disappear out. Such natural selection presents a calculation in itself. These unique structures, consequently, have optimised material performance and functions that result in sophisticated equilibriums and forms that adapt well to demanding environments of Nature. We recurrently come across examples of such optimal matrices also in other forms of matter - structures of crystals, rock formations, behavior of water, etc. and all throughout the natural world, as we observe it. Naturally developed structures feature a number of unique micro-arrangements and non-uniform configurations, all contributing to special functions. Nature calculates forces for each particular point within the actual material. When subjected to loading, the structural strength in different segments is consistent with a change in the amount of applied force. By contrast, human-built structures at present use exceedingly more material and energy than necessary, simultaneously producing waste and undesirable by-products. Frequently these systems are working as in the opposition to natural forces, instead of channeling them and using as an advantage – i.e. to drive processes into desired states. Form follows the distribution of the internal forces in a material structure and it is expressive of the impact of external forces from the environment, producing nearly perfect stability and most elegant forms. This is superior in that natural structures provide a greater structural stability with the least possible material expenditure. 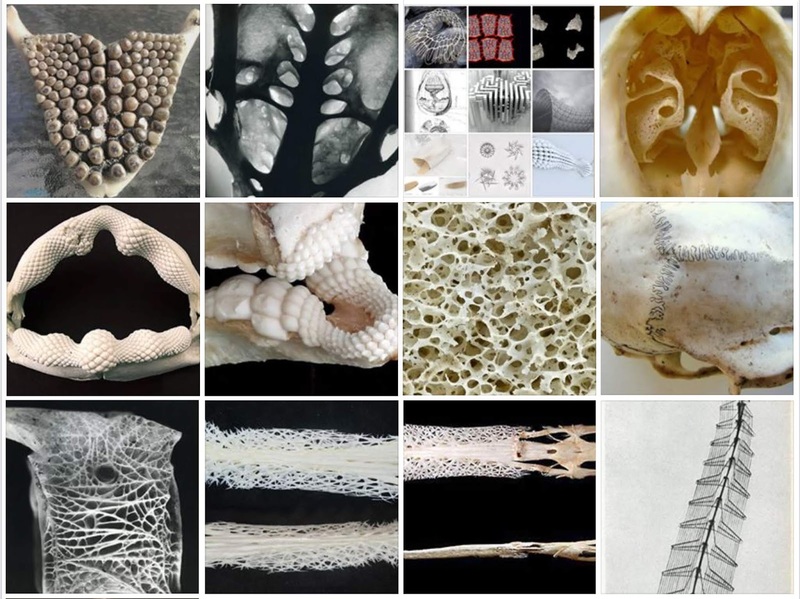 Significant to consider is integrating these superiorities of Nature into architecture and design to a much greater level. Humans should strive to learn from Nature, and enlightened from the understanding of such structures, and the evidence of its strengths, use this knowledge to drive and enhance their own technologies. These unique structures have become a research focus in many areas of science and technologies. By systematically studying Nature’s designs and processes, humans have developed a number of devices that revolutionised technology, (airplane industry, biology/ genetics, etc.). Relative to extent (widespread) of conventional architecture, In building industry biomimicry and engaging natural processes in the design, is still quite a peripheral practice. The fact that it is classed as experimental, expresses the uncommonness and still a relative rarity of application of this knowledge. By systematically studying Nature and building upon these configurations, we are to not only progress faster but also find more equilibrium with the environment –/ with a shift in thinking – i.e. design as a synergy with Nature and natural processes, in a manner that all life gains with each our intervention. In this way, a process of design can be approached with a new awareness – a vision of consciously creating a symbiotic relation with life, enhancing the relation between natural and man-made environments.